Hello everyone! Happy Sunday! With Sunday comes another Stampin Sisters in Christ Clallenge! This week our hostess is the Lovely Linda! Linda has chosen John 13:34-35 for this week's Scripture. "A new commandment I give unto you, That ye love one another; as I have loved you, that ye also love one another. " Use something new on your project - it can be a new product, technique, embellishment - even a color combo that is new for you - show us what you got!! I have used all sorts of new things! 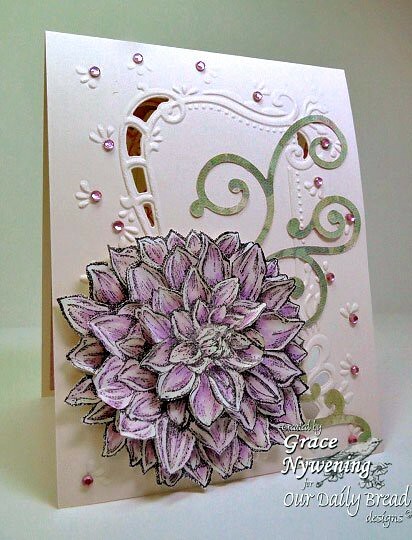 My image on the front of my card is the newly released "Dahlia" from Our Daily Bread designs. It's a single stamp and is wonderful for cutting out layers and popping up with the paper tole technique, which I did here! It is big enough for a scrapbook page, yet small enough to still make a beautiful statement on a card! I stamped it with Memento Ink and colored with Copics, using a new color combination for coloring for me. Because my card stock is ivory I wanted to color the Dahlias with an ivory tone, touched by a hint of violet shades, so I used V12, V000 and Y0000. I never would have thought those colors would blend but they did and I like how they look in real life even though I can't get a photo that I like for the life of me! I then spritzed it with Tattered Angels Glimmer Mist in Irredescent Gold. Yummy! I also used a brand new embossing/die folder from Marianne Designables which I picked up from my LSS, Terryfic Times. I embossed and cut the front panel of the card, then embossed/cut another panel, cutting it to a smaller size for the inside. I stamped another new ODBD stamp from the new "Blessings" series... "Kind Hearts" with Brilliance Ink, and sponged some of the ink on the raised areas of my inside panel. I used a craft blade to slit into the design where I needed to in order for the sentiment panel to fit behind it. I added some bling and matted with a piece of dp from a K&Co Madeline pad. To make sure that the design of my card front exactly lined up with the design of my inside panel, I held it against the front panel on the inside with adhesive on it, then closed the card and voila! They line up perfectly! On the front, because I was using a sketch from Peachy Keen Stamps, I added some QuicKutz flourishes cut from the back side of my violet dp. I added some bling to the front and called it done. I think this is the first time the front of my card has been a single layer but the inside has been more! I chose this new sentiment because to me, it is very reflective of this "new commandment" that this week's verse is talking about. This new commandment that the Lord gave us simply tells us to love one another as Christ loved us. When we really do love one another, we put the other person's best interests ahead of our own. Christ loved us this way when He left His throne in heaven, humbled Himself to become a man, to suffer as a man, to be tempted and tried as a man, and ultimately to be put to death in the most painful way possible so that we could be reconciled to God. It's more than friendship, more than a physical type of love, it's a selfless, giving kind of love that God has for us and we should strive to have for others. How often do we enjoy the comforts of our lives and give little thought to the hurting lives of the homeless, and poor, the seemingly "less than lovely" whom we see every day and drive by without hardly giving a thought. How much of our time do we give to visit the elderly, the imprisoned, etc.? I do believe this new commandment was given to us because God Himself IS Love, and we are to be reflections of Him in us! So reaching out to those in need is one way of showing that love of Christ in us.... but there are other ways too! Sometimes we need to just be silent and humble, not always having to voice our opinions, and not always having to prove ourselves right! Sometimes, we need to go to a loved one whom we have wronged and let them know we are sorry... and that we're not too proud to tell them so and ask for their forgiveness! Sometimes.... real Godly love means tough love! As parents, we know it's always easier to just over look when a child does wrong than to correct them and show them why it was wrong, and yet God wants us to help others see the way that is right! Letting a child "get away with" sin and wrong is not loving them! I see Godly love as caring enough about others to want God's best for them and to do all I can to help them find that and live that for His glory. Now mind you, I'm preaching to myself here! I fail miserably at it often... I'm often selfish, unwilling or just not thinking enough about it. I think God wants us to be intentional in loving one another! One of the greatest ways you can love is to pray for that person! Have you ever had someone hurt you so badly that it was all you could do to even think about them? I have and for a long time I felt such bitterness, pain, anger.... all sorts of sinful feelings toward this person. Then one day God laid it on my heart that I was to pray for my "enemy", and to do good to those who wronged me. Ouch! That was hard! But one day I wrote in my prayer journal what I was going to do and started doing just that. The amazing thing is that MY heart changed! I no longer carry that pain, bitterness and anger in my own heart, and that burden has been lifted from my shoulders! I began to see that person as God does... one who He have His life for because He loved them that much! You know... God is so amazing! In giving this "new" commandment, not only was He wanting us to give our best to others, but He knew in His great wisdom, that loving others was what is good for us!!! He loves US, and wants what's best for US, and He knows that truly loving others brings us joy and fulfillment! Our sponsor this week is Clear Dollar Stamps! We thank Lori for her continued support! The prize is $15.00 in stamps! For complete details on the challenge and our sponsor, and Linda's wonderful devotional, please see the SSIC Blog. Thanks so much for visiting and if you read this far... thank you even more! I know I can be long winded! Lol, but when God lays something on my heart I just have to share it. I hope you've been blessed by this week's Scripture like I have! Have a wonderful week and I can't wait to see all the new things you will show us this week! thanx for being such an inspiration! Grace this is beautiful in inspiration and in execution. Thank you for your thoughts too. Just gorgeous, I just got the new bundle in from ODBD and I love it. Both of your cards and the previous one are stunning!!! This is gorgeous, I love this new release by ODB. What a wonderful & challenging insight on the devotional this morning. Wow! Wow! Wow! This is beyond gorgeous Grace!! I just love the die you used and how you layered the dahlia!! So elegant. You are d bomb girlfriend!! I love reading your words as well!! So true and inspiring!! Have a great day!! TTYT! Beautiful cards and wonderful devotional! God always starts with us, doesn't He? Thank you for sharing both your card and His love. Grace, your card is georgeous, and so detailed. The flower is awesome. The cut out and embossing I just love, especially with the gems. And finally, your commentary is big time thought provoking. Thank you. Wow, I love this Grace! I just got my dalia in the mail yesterday, can't wait to play with it! Reading your devotion was wonderful. Your "ouch" moment struck a chord with me because I have had a similar moment or two. LOL! Have a great week dear friend. oh.my.GOODNESS!! grace this is just absolutely GORGEOUS!!! That cutting and embossing work is fantastic. Thank you ever so much for supporting our Anything Goes challenge at Catch The Bug with Bugaboo Digital Images. Grace, what a gorgeous, elegant looking card. I loved reading the words that God placed on your heart! You are such an encouragement and blessing to me! Hugs!! Gorgeous cards dearie!!!! Hope you are doing well and have a great day!! Very lovely!! I like the layers, color, right down to your cut outs in your first card!! The second one is just as lovely with the different take on the cut out and verse! Grace--this is absolutely lovely!!! Great job! Thanks for playing along with us at Speedy the Cat's Friends challenge this week! So I will just tell you I'm from Jackson, Michigan. What a great papercrafting project and such an important devotion you were working with today. The ODBD set is awesome and would be a wonderful addition to my card making supplies. Have a blessed week . Grace your card is stunning - that flower is amazing! Thanks for playing with Speedy's Friends! Thanks for playing in our color challenge at Operation Write Home! Fabulous card Grace, love the embossed detail, the flower, and sentiment verse. Wow, Grace, this is stunning! I love the Dahlia and the color...I love any purple! The words on the inside are beautiful...they could be used in so many different ways. This is gorgeous! i love the die cut and the bling, and how you colored the raised areas! Wonderful! And, Grace, your words are so true...and a great and somewhat painful reminder. I am always happy and grateful to listen to you share about His Word, or how He wants us to be. You share so eloquently, so clearly...and you tell it like it is. Thank you for sharing as you did...and a wonderful card, too. Beautiful card, beautiful devotion! I always love it when I stop by to see more of what you have to say, and of course, your cards! Your stories are beautiful Grace and I wonder if you share these with others in your life, like at church? I always benefit from reading what you have to say in one way or another... Thank you for sharing, it always makes me feel better. Wow! These are stunning and just so beautiful. I love that embossing folder. Such a beautiful card inside and out! The embossing/cut work is fabulous. Thanks so much for sharing with us at Catch the Bug and have a wonderful day! 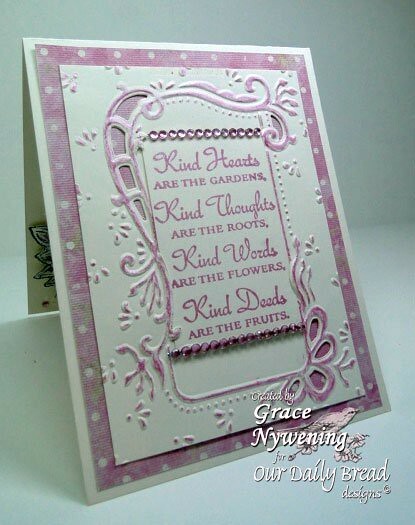 stunning card... thanks for joining us at the Artistic Stamper challenge ... I have just fallen in lurve with Ricky.. he is gorgeous... loving how he is stretching out his paw.. bless!! WOW WOW WOW absolutely Stunning Card!!!! Thanks for playing with us at The Emerald Faeries Garden Challenge. Your card and sentiment are just so perfect for the "In the Garden" challenge. Thank you for sharing it with the BTC&G this month. Such a pretty card. Thanks for joining us at Creatalicious. What a pretty card - love that flower! So glad you linked up at Craft Us Crazy! Such a pretty creation Grace...! Um, Um, Um, what a beauty. I am sitting here drooling over this gorgeous image and those beautiful die cuts. What a magnificent addition to our flower challenge. Thanks so much for playing along in Speedy the Cat's Friends Challenge. Good luck in the drawing for the stamp set. Hope to see you again in our next challenge. Your cards are stunning and you can tell you put a lot of love into making them! Thanks for joining the PK challenge and good luck! WOW wonderful words and fabulous cards hun!! Grace, this is a stunning card and I have searched all over to find that Marianne folder that you used for the base. I even looked at Craft Barn...they didn't have it I know you got yours at a local store, I checked their site and couldn't figure out how to order.